Noah’s Ark Christian Academy is proud to serve the greater Hiram area, and we hope you will come by soon for a personal tour! Noah’s Ark Christian Academy is located at 199 Hiram-Douglasville Hwy. in Hiram, GA. Owned and managed by local professional women (Mothers themselves); our facility was renovated in the early spring of 2008. Our goal is to provide a safe, nurturing environment for children to learn and grow; and to give parents a sense of security when their children are in our care. We take this commitment very seriously and have systems in place to insure this goal is fulfilled. We at Noah’s Ark Christian Academy believe all children are a blessing, and we hope this web site will give you insight to our facility, our philosophy, and our dedicated approach to Academic Excellence. 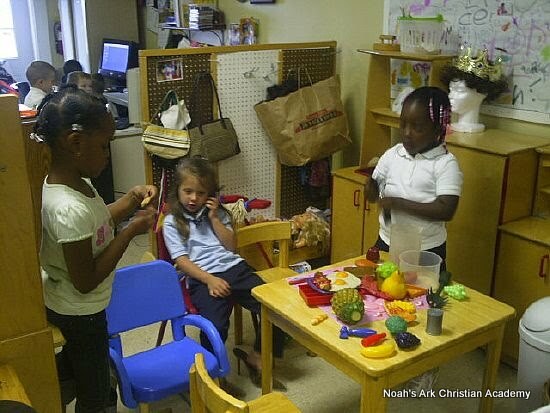 Noah’s Ark Christian Academy provides curriculum based programs, lower child-teacher ratios, healthy meals and snacks, bible stories, Spanish, art, music, and computer skills. In addition to our well rounded curriculum, our children enjoy exploring nature with our walking trails, playing T-Ball, shooting hoops, playing games and having fun while being active in one of our secured playground areas. Noah’s Ark Christian Academy has two acres dedicated to outdoor recreation. All outdoor activities are carefully monitored and managed for age appropriate play. NACA uses the ABeka Book Curriculum for children ages two and older. Our daily curriculum is one that will instill education, imagination and independence. Daily schedules with the age appropriate activities will be posted in each classroom. Each day shall have active periods, teacher directed activities, free play, large and small muscle activities, arts and crafts, dramatic play, rhythm and music, nature and science, and quite time. Toddlers and preschoolers rest in their rooms on assigned mats each day after lunch. The naps are typically from 1 to 2 hours. There will also be outdoor time for each child. There are two age appropriate playgrounds for the children. The children over one are required to be outside for at least 1 1/2 hours of outdoors. If there are medical reasons why your child cannot participate in outdoor activities, please have your physician request in writing. The After School children will have a snack when they arrive at the center. The children will have indoor and outdoor time, along with quiet time in which to work on homework and daily chapel. For more information on the After School Enrichment Program, please see the center director. The safety and security of the children in our care is our number one priority. To this end, our facility has been equipped with state of the art security systems. Live feed cameras monitor all classrooms and play areas. Access to Noah’s Ark Christian Academy is a word protected entry with separate and individual security codes for each parent to access the facility. Every measure will be taken to insure the health and security of the children in our care. 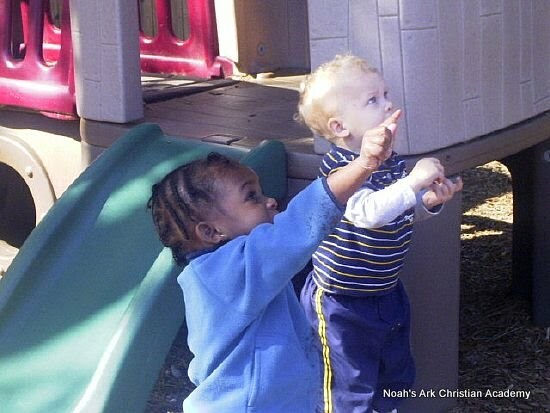 Noah’s Ark Christian Academy serves families with toddlers through Pre-K, as well as before and after school care. Additionally, Noah’s Ark Christian Academy offers Summer Camps. Our teachers are dedicated, nurturing professionals who are truly invested in the development and well being of the children in their care. We love children and it shows!